Malawi has a range of small forest reserves throughout the country several of which have excellent bird watching and walking trails. These reserves offer a rare insight to Malawian rural life and plenty of natural history. Part of the Great Rift Valley, Lake Malawi is flanked by hills inland towards the Nyika Plateau and has some attractive sandy beaches as well as interesting villages to explore. Likoma Island is the larger of two inhabited islands in Lake Malawi which belong to Malawi but lie in Mozambique water. There is one main lodge on the island, Kaya Mawa and only a couple of cars, making it a peaceful place to relax and walk around. This is Malawi's most popular national park with a good population of wildlife. With the beautiful Shire River winding it's way through the park, providing year round freshwater, the park is lush and a haven for birdlife. Boat safaris are a highlight here with elephants and hippos plentiful and some of the largest crocodiles in Africa! Majete is an up and coming park in the Lower Shire Valley of Southern Malawi, a beautiful wildnerness area and excellent conservation project. Fantastic birding and good walking in the region. The Mulanje Massif, also known as Mount Mulanje, is the third highest mountain in southern Malawi near the city of Blantyre, rising sharply from the surrounding plains and the tea-growing estates. Nkhotakota Wildlife Reserve is in central Malawi about 30kms west of Lake Malawi. Nyika Plateau and National Park are located in the north of Malawi and is a beautiful region of rolling hills and huge vistas, popular for hiking and birdwatching. Marsh is a beautiful reserve in which forms joins to the Luangwa eco-system in neighbouring Zambia at the foot of the Rift Valley. This is a beautiful area of rolling lush green hills dotted with tea farms in the Shire Highlands. Easily accessed between Blantyre and Mount Mulanje and has several lovely small guest houses. Zomba town is the old colonial British capital of Malawi and has a fascinating market and several interesting historical sites. Zomba Plateau nearby is a wonderful area for hiking and birdwatching and has stunning views over the region. 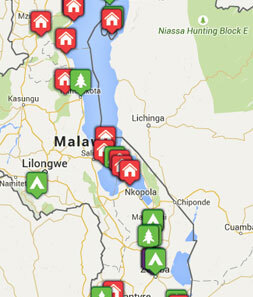 Start planning your tailor-made holiday to Malawi. Tell us what you want, and we will tailor make your perfect trip.  Flight time: International flights to Malawi are either with Kenya Airways (via Nairobi) or South African Airways (via Johannesburg) then to Lilongwe or Blantyre.  Language: English is the official language but not widely used in rural areas. Chichewa is commonly used.  Visas: Not needed for most nationalities but check with your embassy. You need a Mozambique visa for Nkwichi Lodge.  Health: No vaccinations are compulsory but some are recommended. Yellow Fever certificate required for Nkwichi Lodge (Mozambique). See your GP for advice.